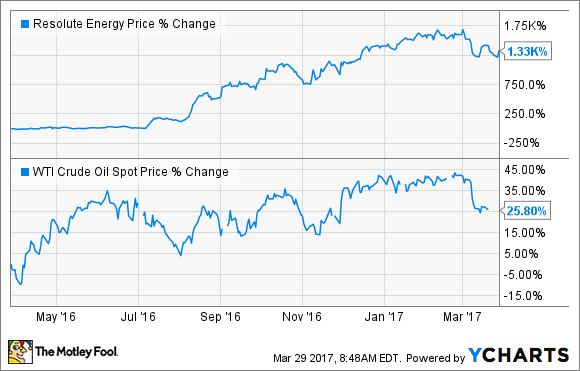 Is Resolute Energy Corp Running Out of Steam or Taking a Breather? The repositioned shale driller is up more than 1,000% over the past year. Shares of Resolute Energy (NYSE:REN) have been blistering hot over the past year, rebounding more than 1,000% since bottoming out last spring. Triggering that remarkable recovery was an update from the company last July, where it announced an asset sale to shore up its finances and excellent well results in the Delaware Basin. Those updates gave investors the confidence that the company had the capability not only to pull through the downturn, but deliver robust future growth. Despite that remarkable run, the stock is only marginally higher than it was right before the oil market downturn started three years ago. That's noteworthy because Resolute is now a much stronger company with a clear path for future growth. More importantly, there are three potential catalysts on the horizon, each of which could restart its rally. The primary reason Resolute Energy's stock has taken a breather in recent weeks is due to the double-digit slump in crude prices, with crude falling from nearly $55 per barrel down to $47.50 per barrel. The reason crude turned over was due to the surge in shale production, which is piling up in storage. However, there has been some good news in the oil market over the past week, which could cause crude prices to reverse course. In Libya, for example, an armed group shut down a pipeline, which is disrupting 250,000 barrels of production per day. Further, the United Arab Emirates (UAE) recently said that it plans to cut output by more than what it had pledged to the Organization of the Petroleum Exporting Countries (OPEC). Finally, OPEC has recently seemed more willing to consider extending its production cuts for another six months to ensure that it drains the market's oversupply. If that deal comes together, it could send both crude prices and oil stocks soaring, likely taking Resolute up with it. A more company-specific catalyst for Resolute is its recent decision to transition to a pure-play Delaware Basin driller. To achieve that goal, the company is exploring the sale of its Aneth Field. Initially discovered in 1956, that legacy oil field originally held 1.5 billion barrels of oil. While the field has produced much of its recoverable oil over the years, Resolute continues to coax more of it out of the ground with carbon dioxide, which has enabled it to deliver steady production and cash flow. That said, a sale of the Aneth Field could unlock value for investors by providing Resolute with a significant amount of money to shore up its balance sheet after recently spending $160 million to bolster its Delaware Basin position. A deal would also give the company dry powder to potentially accelerate its drilling program, or pursue additional acreage acquisitions in the region. Speaking of acquisitions, Resolute's transition to a pure-play Delaware Basin driller could make it a compelling acquisition target. That was certainly the case for Clayton Williams Energy (NYSE:CWEI), which staged its own dramatic comeback -- also surging more than 1,000% over the past year -- as it transitioned into a pure-play Delaware Basin producer. That transformation caught the eye of Noble Energy (NYSE:NBL), which offered $2.7 billion in cash and stock to acquire Clayton Williams Energy earlier this year. That's an extraordinary price for a company that had a market cap of less than $200 million one year ago. That said, the draw for Noble Energy was the opportunity to boost its acreage position as it will become the second largest landholder in the Southern Delaware Basin once the deal closes. Another reason why the Clayton Williams-Noble Energy deal is particularly noteworthy for Resolute Energy is that Clayton Williams holds an acreage position near Resolute Energy. That said, there are several other logical strategic buyers in the area, including Apache (NYSE:APA) and Centennial Resource Development (NASDAQ:CDEV), which also control acreage near Resolute. Of those two companies, Centennial Resource Development is one to keep an eye on because it has been active in the mergers and acquisitions (M&A) market, recently closing a deal that significantly bolstered its acreage position in the region. Further, Centennial has a cash-rich balance sheet that gives it the flexibility to make additional acquisitions. Meanwhile, several other drillers in the Basin have the eagerness and financial fortitude to make purchases, so Resolute Energy would have plenty of suitors should it decide to cash in while the Delaware Basin remains a hotbed of M&A activity. A recent slump in crude oil has cooled off Resolute Energy's blistering rally. However, while the easy money is gone, the company does have three potential catalysts on the horizon. Because of that, its epic run might not be over just yet. Can 20 Billion Barrels of Oil Ignite Growth for These 4 Oil Stocks?